While written with the Sacramento Valley in California in mind, growers, buyers, and operators of dryers, warehouses, and processing operations worldwide will benefit from this handbook. 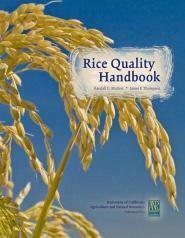 The Rice Quality Handbook is a collaboration of University of California Cooperative Extension advisors, UC Davis faculty, and researchers at the USDA Western Regional Research Laboratory in Albany, California. Illustrated with 39 color photographs, 58 graphs, and 35 line drawings. An English-metric conversion chart and an index round out this essential manual.